On cloud nine the morning after the Sydney launch, with bouquets from dear friends and Ashfield Council. 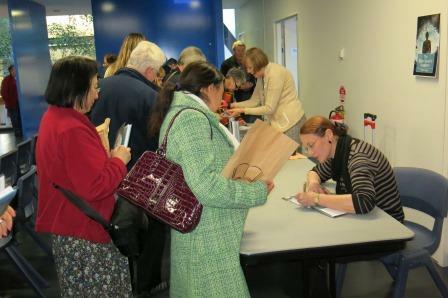 I hadn’t considered a separate launch for The Water Doctor’s Daughters in Australia, but a few months ago a generous offer came from Sydney’s Ashfield Library to do a book signing. It was to be part of their very popular ‘Authors at Ashfield’ programme. It was then suggested that the signing could be the official Australian launch, a chance for me to invite friends and family who had been unable to attend the UK launch at Great Malvern. 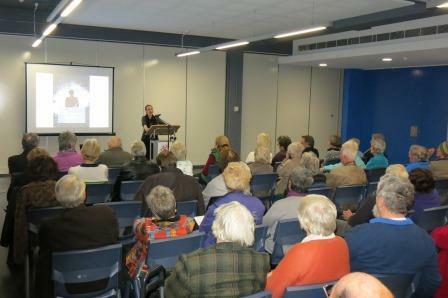 I worked at Ashfield Library for ten years from 1976 until 1987 so it would be very special going back as author. Two people who started at the library soon after me and who still work there are my good friends Mandy and Gina. Clearly Wednesday June 19 was going to be very emotional day! What to wear? Well I’m no young fashion icon and high heels were out of the question, so comfort ruled the day. I certainly didn’t want to trip on the way to the lectern! There was one problem, I’d forgotten to bring my moisturizer down from the Mountains. I had a little peep in my mother-in-law’s bathroom cupboard and found some exceedingly expensive anti-aging cream. It seemed to do the job and who knows, it might even have helped a bit! We arrived in plenty of time for Rob to make sure I was OK with the PowerPoint presentation. Was impressed to see that tea and coffee and snacks were available at what was a free event. I could only manage water! Things got underway with a violin recital by the talented Caroline Kelly. As Caroline played I caught up with Mandy and Gina, who gave me a beautiful bouquet of roses and lilies. Was able to thank Team Leader Therese Scott for organizing everything so well. 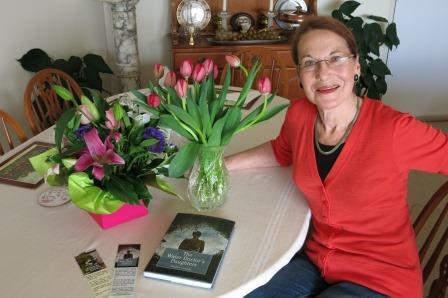 Also met the lovely Janet Grundy, who would be selling copies of the book. An early arrival was Robin Walsh, fellow researcher and author of Elizabeth Macquarie; In Her Own Words . Robin would be explaining how my own Macquarie research led to the writing of The Water Doctor’s Daughters. By 1.00pm the room was full so it was a bit daunting, but gratifying to see so many people. Therese said a few words and introduced Ashfield Council’s General Manager Vanessa Chan, who presented me with a bouquet of tulips. She referred to me as ‘ a daughter of the library’, which was really sweet. Robin’s address was so kind and generous and a hard act to follow! Then it was my turn. So many people to thank! The PowerPoint presentation followed, with me operating the computer for the first time via a little ‘wireless’ contraption. Noticed afterwards that I had my sleeves rolled up for work! Well, I’m a farmer’s daughter. There was a Q&A session before the book signing. Lovely to see plenty of hands up. I had brought along some small gifts for purchasers, associated with my research at Oxford’s Bodleian Library and at Great Malvern. To my amazement Janet sold out of copies and had to take orders. Presents a slight difficulty re me signing them but I’m sure we will sort something out. Among those who presented books for signing was a borrower I knew well all those years ago and another dear friend and ex-library colleague, Patti-Lyn. Pity I can’t sign with a grand flourish like other authors but never mind. Being left-handed I was more worried about smudging the ink. Hope I didn’t spell anyone’s name wrong. Selling and signing, albeit left-handed! My sincere thanks to everyone who attended and to all involved in the event. It was a such a special day for Rob’s elderly mother as well. Handle with care…my favourite pic. I might add that the whole publishing world is undergoing enormous change right now. Life is difficult and challenging for we writers, but occasions such as this make it all worthwhile. Next stop… Marlow in the UK for the launch of All Along the River, to be held at their local Library. No wonder I LOVE public libraries so much. If you would like to leave a message (I do like to hear from people) use the comment box below. NOW I KNOW IT’S A NUISANCE, BUT TO DEFEAT SPAMMERS YOU HAVE TO DO THE LITTLE SUM FIRST, UNDERNEATH THE BOX! It was so special. I’m glad Rob took lots of pics though because I was too overwhelmed on the day to take it all in. I could ask to be better at public speaking but I guess that’s up to me and will get easier! I must have missed your account of the UK launch – been away for a month and only just back in the swing. This event sounds to have been a really warm & wonderful experience – and more books were ordered! It doesn’t get much better than that – congratulations! 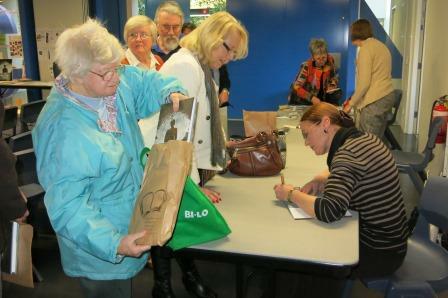 Hi Ann, the UK launch was at Malvern on March 23rd, on that terribly snowy weekend. It was great, but the weather was quite a challenge for us all especially as Malvern is so steep! Thank goodness for loyal friends and hardy locals. This one was extra special because relatives and neighbours could come along. Congratulations Pauline, the launch sounds wonderful. I am sorry I was not there.Your account of the day quite moved me. I thoroughly enjoyed The Water Doctor’s Daughters and now I am waiting with great anticipation for the launch and reading of All Along the River. Two books published in one year, I am so proud of you! And to think you were so nervous when all this kicked off! You’re a pro, now. Really pleased that things are going so well for you.